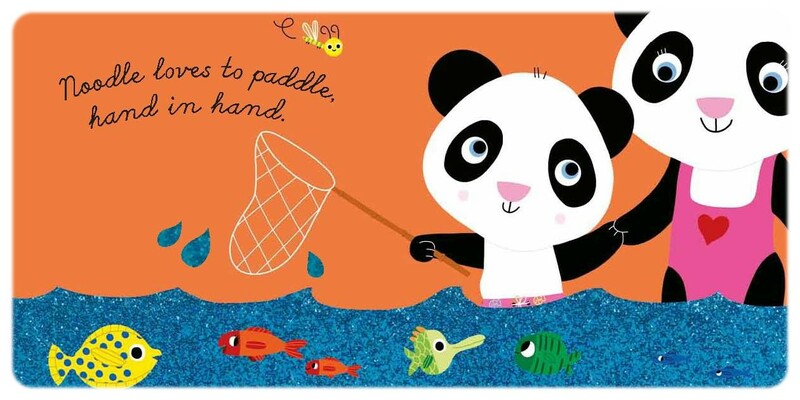 Noodle the Panda is spending the day at the seaside with his mummy: watching boats, splashing and digging, it is so much fun. He just loves the beach! Noodle the Panda loves to play: pulling his little duck on wheels, throwing a ball, playing with his toy phone, hiding under a blanket. It is all so much fun! But what he likes most of all is to cuddle with his mummy. I’ll admit that what first attracted me to this series is its French illustrator, Marion Billet. Marion has illustrated a lot of books over there as well as working for French children’s magazines (which are nothing like children’s magazines here) and we have often seen her work specifically in Les p’tites filles à la vanille. Her style is simple, clear, brightly coloured and perfectly pitched at the intended very young audience of this new series. Noodle the panda is a great central character, and what a great choice of an animal this is. 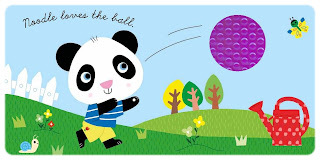 Not only are pandas cute, cuddly and renown for being very mild-mannered but the black and white colouring of his fur makes him stand out from the otherwise brightly coloured background of the illustrations; this is perfect for tiny audiences, as it helps them focus. The stories are kept very simple, with rhyming text, lots of repetition and similarly constructed sentences, and again this is perfect for the intended audience . The message of the stories are very positive: Noodle “loves” all sorts of things, there is no negativity at all, and I think it is important to promote positivity at such a young age. Each book finishes in the same way, with a mirror on the very last page. If my own children are anything to go by, babies love this and will spend a long time just admiring their reflection. At this age, it is so important to allow children to interact with the books; the mirror will capture their attention, as will the clever touch and feel elements (my favourites were the ball in Noodle Loves to Cuddle and the sticky peach in Noodle Loves the Beach). There is so much to explore while sharing with adult readers but the sturdy pages will also allow the youngest readers to be let to experience the book on their own. For toddlers, there are also plenty of familiar items to spot, broadening the scope for interaction with the book. Nosy Crow have already firmly made their mark in the picture book market. Their books are instantly recognisable, and this new adventure in the baby book market is sure to be a success. I think little children respond well to series at this age as they thrive on routine and the familiar, and as a brightly coloured character-led series, the Noodle books are a great addition to this market; series and character-led books can be a bit uninspiring for this age-range, and the quality of the Noodle books will undoubtedly make them stand out from the rest. 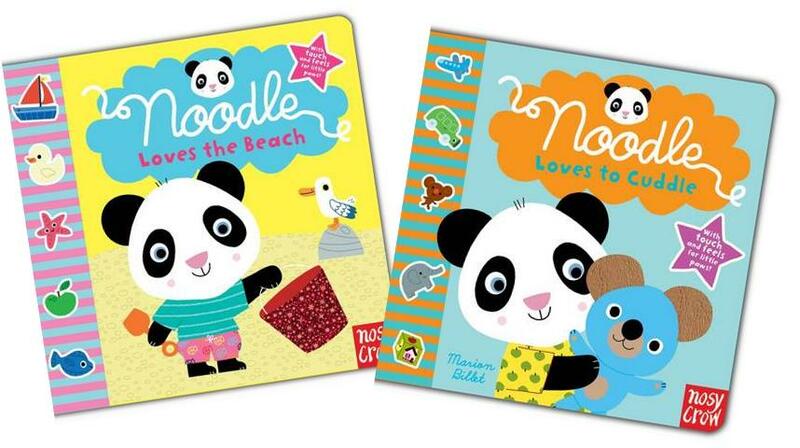 A further four titles are planned, two of which, Noddle Loves to Eat and Noodle Loves Bedtime, will be out in August. Check out Marion Billet’s beautifully designed website here. 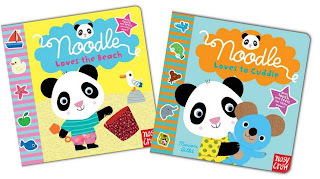 Many thanks to Nosy Crow for providing review copies of the two Noodle books. It;s great to see a really thoughtful review of books for babies. We think really hard about what goes into these books and about matching text and images, and it’s lovely to have this appreciated. Thanks Kate. Books for babies are so important, they are not only important to build the foundation of a lifelong love of books but also are here to help babies make some sense of the world. Which is why I really loved the positivity portrayed in the Noodle books.